That is the motivation for us to confidently step forward on our long journey. 2018 is also a time when we focus more on the water resources field with activities in Dak Lak, Quang Nam and Thua Thien Hue provinces. Specifically, we are continuing to promote the role and responsibility of the community with activities related to the management of water and fisheries resources in the Serepok River basin aiming to guide livelihood development and sustainable water resource exploitation. DIRECTOR OF CSRD M.Sc. 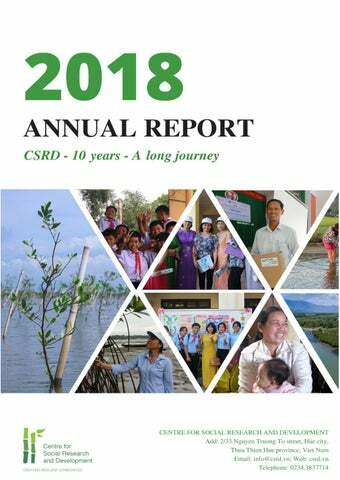 PHAM THI DIEU MY On behalf of the Centre for Social Research and Development (CSRD), I would like to express my sincere thanks to all sponsors, partners, friends, colleagues and communities who are always by our side and support us during the development process of CSRD. 2018 is a milestone marking the journey of 10 years of establishment and operation of CSRD. This is an important time for us to look back what has passed and what has been achieved. Among the achievements that CSRD has today, which cannot be lack of your contribution. We are always aware and respectful of that. 2018 ended with many challenges and successes but above all, we could see that our activities and projects bring benefits to the community and society. In Quang Nam province, we continue to implement advanced activities to assess the impact of water and gender on women and enhance women's position in livelihood development. The goal is that affected communities and vulnerable groups will be cared for and supported to be able to master their lives. In Thua Thien Hue province, CSRD has implemented two main programs: (1) Ecosystem-based adaptation (EbA) to climate change in urban and coastal areas and (2) Reducing plastic waste to environment, river and sea. These are two outstanding issues and are concerned on the current global scale. The initial results that we have achieved, which are recognized by the stakeholders and it is also a motivation for us to continue our mission. 2019 is coming and there will also be many challenges and opportunities await us. We will make more efforts to bring more benefits to society and community. We hope you will continue to accompany with us in the road ahead. Once again, thank you very much! FORMER DIRECTOR OF CSRD M.A. LAM THI THU SUU CSRD - 10 years: Consistency in vision - Diversity of solutions Quality of impacts. I am so excited and proud to see 10 years of CSRD's operation with outstanding results. In the early days, building of strategic vision, discussions and notes of founders like me were showed only in the form of words and writing. At the present, CSRD has achieved visible, measurable results. The positive impacts that CSRD brings to communities and the environment in the last 10 years are outstanding in terms of quantity and quality. To maintain the belief in mission is that helping vulnerable communities, affected by external factors such as climate change, hydropower development, industry, agriculture, CSRD has focused on promoting their strengths on gender equality, water resource management, climate change adaptation. In addition, CSRD has constantly innovated to find diversity in solutions through the construction of projects with different characteristics and colors to suit specific conditions. CSRD has also established many sustainable partnerships from the community levels to other important stakeholders. These partners in cooperation with CSRD to achieve important results for society and the environment. Thank you to the consultants, volunteers, employees who have worked, are working at CSRD for 10 years because of their efforts to get positive results today. Despite many difficulties, these people are very exerting themselve on making their own dreams, community's and the founders' dreams come true. and facilitating to maintain networks themselve of groups of people, especially women groups in affected communities. 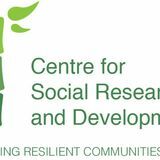 CSRD also designs and applies innovative approaches to achieving the project's key objectives, such as gender-based approaches, ecological-social change approaches, and research community-based approaches, rights-based approaches, and access to regional networks. We appreciate very highly every effort and cooperation from the communities we have the opportunity to work with as well as the support and companion of international partners. We expect our cooperation to continue to be effective in building sustainable development communities in 2019 and the following years. INTERNATIONAL PARTNER Ph.D. PHILIP BUBECK POTSDAM UNIVERSITY – GERMANY Restoring urban water bodies in the historic center of Hue city, planting mangroves along the Tam Giang Lagoon with local communities, conducting a survey among more than 1000 households to learn about flood impacts and the role of gender and ecosystem-based adaptation, providing capacity building to members of the Women’s Union to strengthen the role of women in disaster risk management, engaging with a wide range of stakeholders, and producing a film about the project… : All these were just ideas to enhance flood resilience of urban and coastal communities in Thua Thien Hue province when we, i.e. CSRD and the universities of Potsdam and Amsterdam, submitted a joint proposal to the Global Resilience Partnership Water Window back in 2016/17. BENEFICIARY FROM THE PROJECT Mrs. LE THI XUAN LAN I am the leader of a group of the Women's Union in Vinh Tri village, Hai Duong commune, Thua Thien Hue province. I am one of the women in the village who has an opportunity to participate in the project about improving knowledge in disaster prevention, and learning about the benefits of the ecosystems. The project's topic is quite familar, but the knowledge of the project is completely new, useful and attractive that I have not been approached before. When participating in the project, I was trained on protecting and maintaining ecosystems such as lagoons, rivers, ponds and lakes, visited and learned about ecosystems in Loc Vinh commune. At the same time, I could exchange and discuss with other women about the knowledge that they have been trained. I also participated in communication activities, and collective activities about prevention before, during and after natural disasters. The knowledge that I learned helps me feel more confident and active. I realize that people are an integral part of nature, so we need to protect and improve the resources that nature gives us for our own lives and for our descendants. Besides improving people's awareness, the project supported the planting of 3.25ha of mangroves in Vinh Tri village, bringing a lot of excitement to the villagers because of mangroves' benefits. Mangroves will be the habitat of shrimp, fish and crab species so that people are able to improve their income. When the mangroves grow up, we will be able to develop community tourism, aiming to sustainable development based on local ecosystems. I would like to thank project and benefits it brought to me and my community. I hope that the project as well as the Center for Social Development Research will have more activities to support other communities such as community of Hai Duong commune, so that women will have more knowledge and improve our capacity and position. Women participate in planting mangroves in Hai Duong commune. Background Thua Thien Hue province is a coastal province located in central Vietnam. The Tam Giang Lagoon – South-East Asia’s largest lagoon – and adjacent coastal areas are the basis for the livelihoods for many poor and vul-nerable people, who directly depend on these natural resources. In recent decades, the low-lying coastal areas have been repeatedly aected by severe ooding from the sea, rivers and heavy rainfall. Ecos stem-based adaptation as a mean to women s empowerment in DRM and CCA. ResilNam-Coastal strengthened the role of women in DRM and CCA through ecosystembased adaptation (EbA), namely the restoration, conservation and sustainable management of the mangroves in the lagoon. EbA uses biodiversity and ecosystem services to provide services that help people adapt to the adverse eects of natural hazards and climate change. Project activities Planting and restoring mangroves Jointly with local communities and the women’s union, about five hectares of mangroves were planted in Hai Duong and Loc Vinh communes in Thua Thien Hue province. on flood resilience and EbA for almost 700 women. These events included theatre performances, an EbA quiz and the karaoke of flood-related songs. Creating a direct benefit from EbA To create a direct economic benefit from the mangroves, members of the women’s union received training on running small-scale ecotourism. Moreover, a micro-credit fund linking livelihood support for women and mangrove conservation shall be established. Impact: The flood resilience of 4800 coastal residents was increased, who directly benefit from the planting of mangroves in the two locations. Many more coastal residents benefited indirectly through capacity building and training and the other co-benefits of the implemented activities and synergies with ResilNam-Urban. Mangrove forest in Loc Vinh commune. Mangrove forest in Hai Duong commune. Background Hue city is the provincial capital of Thua Thien Hue province in central Vietnam (Figure 1). The Huong (Perfume) River winds its way through the densely populated city and the complex of Hue monuments, which is recognized as a UNESCO World heritage. Both climate change and rapid urbanization have changed the topography and the hydrology of the city, aecting traditional water bodies and creating unpredictable and possibly more extreme levels of flooding. the focus on “hard” (i.e. structural) and “exclusive” (i.e. top-down) structural flood defense measures. Strengthening the role of women in disaster risk reduction and climate change adaptation. Eco-system based adaptation as a means to women’s empowerment in DRM and CCA ResilNam-Urban strengthened the role of women in DRM and CCA through ecosystembased adaptation (EbA), namely the restoration of urban water bodies in the historic city center of Hue. Project activities Restoring urban water bodies Together with the disaster management center, the women’s union, and local residents we restored three urban water bodies in the historical city centre. Capacity building and training Following capacity building activities by the Disaster Management Centre, the Women’s Union organized lively communication events on flood resilience and EbA for almost 700 women. These events included theatre performances, an EbA quiz, and the karaoke of flood-related songs. Women participate in the training and communication activities for raising awareness. Communication activity on disaster prevention is organized with the active participation of women. 1. Conducting a research on early warning systems and the operation mechanism of hydropower dams. This study provides in-depth analysis of existing early warning systems, activities of the Provincial Center for Natural Disaster Management Commitee (DMC) and local hydropower companies. There are 5 communities were involved in the project: Phong Son commune, Phong Dien district; Sia town and Quang An commune, Quang Dien district; Huong Vinh commune, Huong Tra town and Phu Mau commune, Phu Vang district. 2. Organizing 5 consultations and seminars with hydropower companies, DMC and communities along the Huong river basin. 3. Developing innovations in communication links and improving early warning processes. 5.Organizing 5 training courses for the communities on emergency warning and evacuation procedures when floods occur. 6. CSRD has supported 46 portable speakers and 500 key holdings printed information of disaster prevention departments at all levels for 05 targeted communes. Through trainings, seminars and communication activities, communities understand more about the changes of flood behaviour in recent years and in the future to take the initiatives in prevention and evacuation process. The communities are able to access and use forms of communication on mass media and early warning means provided by project. Fisheries exploitation in Tam Giang lagoon. Project objectives: 1. To facilitate meaning participation through a network of communities in Serepok river basin governance in Dak Lak province. 2. To enhance awareness and understanding of the public and policy makers through sharing and promoting practical experience in community-based forest and river basin governance at national and regional levels. Fish cage farming model of community group in Tan Phu – Dak Lak. Targeted communities: 04 community groups in 03 districts Krông Ana, Buôn Đôn, Lăk: 1. Tân Phú village, Ea Nuôl commune, Buon Don district; 2. Ea Tung village, Ea Na commune, Krong Ana district; 3. Fish Association in Na Wer village Ea Wer commune, Buon Don district; 4. Fish Association Lien Son, Lăk district. At the present time, the model of raising fish on the Srepok River in Tan Phu village, raising fish in ponds in Ea Tung and Ea Wer villages are being operated and bringing income to the selected households. CSRD is still continuing to build a model of comanagement of water surface and fishery for protecting aquatic resources and tourism model in the Lak lake with the participation of the Fisheries Association. The communities in project area have been supported in capacity building in natural resource governance and management, networking and sharing livelihood initiatives as well as learning experiences from other communities through training courses, seminars, forums. Typical aquatic species of the lagoon area. Women participate in research activities of the project. INTEGRATING GENDER IN LARGE SCALE DEVELOPMENT PROJECTS - HYDROPOWER CASES IN THE CENTRAL AND CENTRAL HIGHLANDS AREAS - VIETNAM Donor: Oxfam Duration: 3/2018-3/2019 Area: Quang Nam Province Vietnam is facing many bad environmental and social consequences for sustainable development in the region. Vu Gia - Thu Bon river in Quang Nam province has 34 small and medium sized hydropower projects, 10 constructions have been built and used. Women are vulnerable subjects because of environmental and social impacts, but there are a little women's participations in this process. Gender issues and social issues have not been resolved after constructing dam because of the lack of relevant handling mechanisms. Dam construction projects have many negative impacts on the role and position of women in families and communities, but there is no Gender Impact Assessment before dam construction. The Environmental Impact Assessment (EIA) is conducted by dam operators and approved by the Government, while not fully implementing the Social Impact Assessment (SIA) and Gender Impact Assessment (GIA). hydropower projects in the Central, Central Highlands – Vietnam” This gender impact assessment once again confirms the difference in labor division, as well as the control of human being resources between men and women in communities affected by A Vuong hydropower development. Besides, there is no attention to Gender issues during development projects implementation process, which not only brings negative impacts to the community in general but also impacts more strongly on women who have suffered much disadvantage. hydropower development. For development companies, it is necessary to continue building sustainable development models, developing new dialogue, support and access mechanisms such as social impact assessment and gender impact assessment. Learning about gender roles through research tools and methods. Representatives of communities exchanging and sharing information. Participants in the final workshop of the project held in Tam Ky city, Quang Nam province. Donor: United States Agency for International Development (USAID) Duration: 7/2018-6/2019 Area: Thua Thien Hue Province Plastic pollution in our oceans is a major global problem which needs support and action from international, national and local communities. Hue City contributes to this global problem. It produces nearly 20 tons of plastic waste every day and some of this makes its way into the Huong (Perfume) River and on into the sea. Thien Thua Hue Province has prepared a Master Plan with a vision for 2050 to manage its solid waste management, but it will require coordinated and committed action across the whole community to achieve its vision. This project will contribute to that vision by promoting the 3Rs (reduce, re-use, recycle), by introducing waste separation at selected local schools, through public involvement in the 5% reduction target, and through media publicity. The aim of the project: The aim of the project is to reduce and recycle plastic waste in and around Hue City. Wewill achieve this aim through three linked projects which will have impacts on solid waste in the City, on the river, and at the coast (at the source, in transit and at destination). The project aligns particularly well with MWRP objectives funded by USAID. Project objectives and associated activities are described below:  To raise students’ and community awareness of the negative impacts of plastic waste on the environment;  To raise awareness and change practice through different and innovative measures to reduce plastic pollution;  To reduce plastics pollution in local schools, on the Huong River, and on the coast;  To change people's behaviour and actions to protect the environment. The project focuses on implementing at 04 secondary chools: Tran Cao Van, Phan Sao Nam, Nguyen Thi Minh Khai and Hoang Kim Hoan School, and 02 high schools are Quoc Hoc and Bui Thi Xuan. Waste collection and classification activities will take place throughout the 2018 school year and next school years. In addition, there are many activities within the framework of the project such as extracurricular activities to learn about the topic of waste, competitions for designing creative instruments from recycled garbage materials, fashion shows, poster design contest, Ring the Golden Bell activity held to raise awareness of students. In addition, the project will build and implement many research activities such as testing installation of litter traps in the Huong river basin, a beach cleaning campaign in Thai Duong Thuong village (Hai Duong commune, Huong Tra town, Thua Thien Hue province). In addition, we are in close cooperaation with schools, Hue Urban Environment and Public Works Joint Stock Company (HEPCO), Hue City Urban Management Department and other relevant agencies and departments to complete and promote activities to respond to the initial objectives of the project. Extracurricular activity at school on the topic of plastic waste. Integrating contents related to plastic waste in school subjects. Study tour in the lagoon area of Thua Thien Hue province. WEBSITE AND FANPAGE - Website: csrd.vn - Fanpage: Centre for Social Research and Development (CSRD) We use our website and fanpage to provide information and to communicate. It allows the users to easily find information, activities and events and is in both Vietnamese and English. ORGANIZATIONAL CHART CSRD applies a Quality Management System (QMS) to all its operations. It is committed to transparency and accountability in all its work including an annual financial audit and assessment of staff capability. CSRD sees this as an important issue which we have now followed for several years. Municipal waste program to recycle plastic waste pollution in the city, on the river and on the coastal area of Thua Thien Hue province. OUR DONORS AND PARTNERS We thank all the donors and partners who have been with us in 2018. Your help and support has delivered projects which encourage the healthy growth of communities and allow them to adapt to a constantly changing economy and society. We look forward to working with you in 2018 and beyond.